I think JK's days of playing calmly on the bathroom floor while I shower are over. She has discovered the toilet paper. The picture shows only a little of what she had taken off the roll. I'll have to put her in the crib now if I want to shower. I don't have much to show you today. My patio cushions are coming along slowly. Maybe by the time summer is over they'll be done. I'm also making something that I think would make a good giveaway. We'll see. And here's a preview of my latest unfinished project, a reversible patchwork apron: I don't know what I am going to do with it. Keep it, give it away, or maybe sell it. 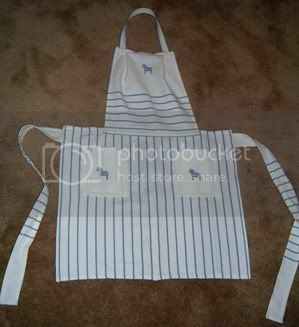 I already have an apron that I made, and I don't use it often enough to need another one. Besides, this new one doesn't coordinate with my kitchen! I love the flowery fabrics though. All the patches are from a friendship quilt exchange I did a couple of years ago at Mrs.Survival This is the apron I currently use. I made it out of 3 Ikea dishtowels that we got for our wedding. I like how the blue and white looks with my turquoise walls. Ah yes. The TP escapades of a young child are near and dear to every mother's heart. Just wait until she's old enough to throw it into the toilet. All of it...Ugh. Your aprons are adorable!! You do beautiful work. Fun apron! I'm TOTALLY going to Ikea next weekend when I'm in Orlando. I don't remember having kid issues with the toilet paper... however, my dopey dog thinks it's a toy for her! Drives me nuts. Ok, this is another great idea! I've got 3 tea towels I've been trying to figure out how to make an apron out of, this might work! I'll have to see if the cute writing on it would still show!